The state of American politics under Donald Trump and his privy Councillor Stephen “Steve” Bannon is a perfect example of using majority vote to create autocracies. Majority vote lends itself to being divisive. The decisions are always made with yes or no answers. A bill is voted up or down. There are no other options. And once a group is divided into yes’s and no’s, people begin to manipulate others to form a majority so they can win. Decisions by majority vote allow and enable manipulation of outcomes with no reference to the quality of the decision. Majority vote has no required test of truth. Once won, the fact of winning becomes validation. The test of truth is only winning. The nation-wide depression that followed Trump’s election was palpable in public and private spaces. The shock has resulted in a long winter, even though we have had little snow and temperatures in the 70’s sometimes. The malaise and despair lifted temporarily with the images of demonstrations against Trump around the world. The ones around the world in small towns as well as large, were very helpful. 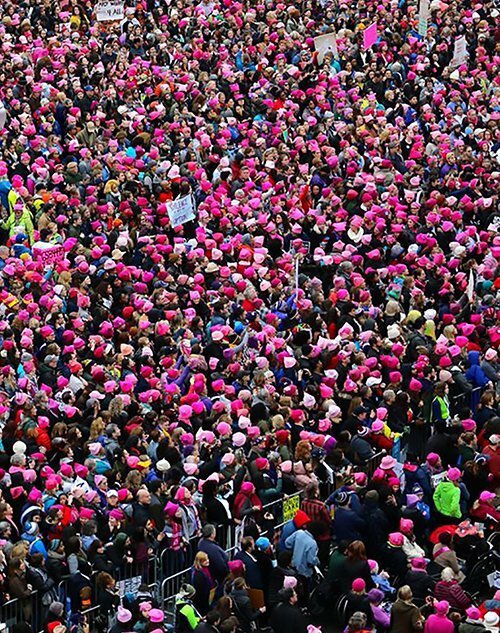 The resistance continues with pink hats as its rallying symbol. And there are three more national marches on Washington planned for April and May for climate change, science, and immigration. I’ve knitted 19 hats for the PussyHat Project and have orders for 4 more. When a woman ordered 25 miniature PussyHat pins on very short notice as gifts for her trip to China, several knitters stepped up and met the three-day deadline. I’ve almost finished a Brain Hat for the March for Science on Earth Day on April 22nd. Knitting groups are beginning all over the nation and pink yarn is frequently sold out online as well as in shops. Some of the brain hats have pink ears. My Brain Hat wearer objects to pink brains. She’s a scientist. Between trying to find pink yarn and knitting and watching Perry Mason reruns, I’ve been trying to think of something to follow my post pointing out the similarities between Trump and Hitler. Unfortunately, the similarity to Hitler continues, not only in his rhetoric but in his outrageous and lawful edicts. All information on government websites that contradicts his views have been summarily withdrawn, including statistics on things like climate and banned school lunch ingredients. The fear of Trumps autocratic proclamations returns as his election promises are implemented with previously unknown speed. The ignorant race in where experts fear to go. In fact, Donald Trump did not win the popular vote. Hillary Clinton won that by almost 3 million votes. But in our presidential elections we have what was meant to be a protection against the manipulations of ringmasters, more accurately bullshitters (vulgar but accurate). Even in office, in front of the whole world, Trump continues to rant the characteristic bullshitter’s brand of nonsense, lies, and exaggerations. He repeats them over and over. There are many newspapers and websites now tracking Trump’s falsehoods and “alternative facts” as one of his advisors, Kellyanne Conway, calls them. One of the most comprehensive is Politifact. Sociocratic principles allow any group of decision-makers to use majority vote if all its members consent to do so. Consent as a decision-making method requires that the deciders be able and willing to sit together to work out a solution that works for everyone, not just the majority. Obviously this is not possible in national elections, or even local elections. The United States had a population of approximately 2.5 million In 1789. Though most could read and write, many eligible voters had no formal education, spoke different languages, and had just escaped autocratic monarchies. Did the people have the capacity to elect good leaders? Communications from one state to the other was still slow and unreliable. Would the voters have enough information to accurately judge one candidate against another? Majority vote was untested in national elections. The framers knew they were on shaky ground. What protection did the nation have if this didn’t work? The Constitutional Convention, representatives from each of the 13 states feared the election of a huckster or ringmaster who could charm but never lead. To prevent this, they created a system of electors from each state who would convene as an Electoral College to actually make the final decision in the election of the President. Similar to colleagues in a university, electors would debate the merits of the presidential candidates and cast votes according to the debate as well as their state’s popular vote. They were not required to follow the popular vote but to make a decision based on the deliberations of the Electoral College. This is markedly similar to a sociocratic circle process and was no doubt influenced by the strong Quaker presence in Philadelphia where the Convention was held. After discussion and debate, during which the views and votes of each state would be presented, Electors would cast votes that represented the best interests of the people who elected them and of the country. Electors were never meant to simply reflect the number of votes cast for the winning candidate in their state. They were not meant to be a rubber stamp. They were supposed to be a corrective force, when necessary, or a double confirmation. Unfortunately, the electors no longer meet as a college to debate and decide. They simply phone in their votes. In many states they are elected by state law to vote for the majority candidate, but not in all. Majority vote, not reasoning, rules the process. Hillary Clinton would have been elected if less than 4% of the electors had voted for her instead of Donald Trump. Obviously, it didn’t happen. After the election, the unprecedented caustic and oppositional tone of the election was unleashed on electors. Electors were heavily lobbied, threatened, and offered favors. Trump promised a visit to Mar-a-Lago, his 20-acre majestic estate and exclusive golf club in Palm Beach. Some electors followed the party line because they were afraid of rabid Trump supporters. Others because they truly believed Trump would be a new and corrective force in American politics. They wanted to shake things up. But most followed what they considered to be the law. Another factor beside state law and party politics influenced the election. Electors are chosen from geographic jurisdictions drawn by local political parties. The dominant political party in a geographic area heavily influences that process. The majority draws the jurisdictions to favor themselves, thus jurisdictions are drawn with a bias. They are used to create artificial majorities. That is how Trump was elected president and lost the popular vote. Trump courted his own ideological base and electors. It was the focus on electors, not “the people,” that resulted in his election. If the Electors had accurately reflected the actual vote, Hillary Clinton would have won the election and America would have what many authorities have said would be the most qualified president in over 100 years. Majority vote creates a hierarchy of power with each level fed by the majority at the lower level. The power of the majority is compounded as the majority vote creates another majority at a higher level. The ultimate level claims the power of the majority as validation for their decisions. As Trump states frequently, “I won. I’m the president. I decide. If I do it, it’s legal.” He really believes that. This is how majority vote can be used to create an autocracy. We’ve been using majority vote for centuries now, and usually the majority has some restrains. It has elected good presidents and some of questionable ability. Some with just wrong-headed views. Allegiance to a political party has come to dominant the ability to be elected, and re-elected. Party affiliation is now more determinative of government decisions than information or wisdom. Parties are built using majority vote with the narrowness of the views of the majority increasing with elections at each level. Trump is a Republican because affiliating with that party was his best chance of winning. A person like Trump feels no need to convince or even cajole all the people. He has claimed the majority as equal to the whole so that’s all he thinks he needs to do. He may learn differently but so far the prospect doesn’t look hopeful. He has too much autocratic control.